Earthrise: This iconic view of the Earth rising above the lunar surface was captured by Apollo 8 lunar module pilot Bill Anders during the first human voyage around the moon on Dec. 24, 1968. Anders flew around the moon with Apollo 8 commander Frank Borman and command module pilot Jim Lovell. On Dec. 24, 1968, Bill Anders orbited the moon as lunar module pilot with the Apollo 8 crew on humanity's first voyage to another world. 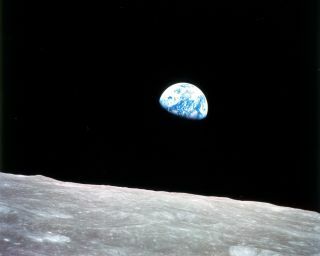 It was he who took the iconic Earthrise photo on Christmas Eve, a gift of perspective in a turbulent year. Here, Anders reflects on Apollo 8's historic flight, Earthrise and the impact a photograph can have for Space.com's Expert Voices: Op-Ed & Insights. Fifty years ago today, I was part of a crew of three men orbiting the moon, cocooned inside a 13-foot by 11-foot space capsule. Inside, there wasn't much space at all. Outside, the immensity of our galaxy boggled our minds and dazzled our eyes. Despite substantial risks in moving up the launch date in order to get ahead of the Soviet Union's space program, we set world records for speed, altitude, and distance. We became the first humans to leave low-Earth orbit, and to orbit another celestial body. Ours were the first human eyes to see the far side of the moon. Months later, Apollo 11's Neil Armstrong and Buzz Aldrin walked on the lunar surface. The audacious nature of what NASA achieved in winning the space race remains unsurpassed. Those efforts fueled further progress that continues today, often through private enterprise. NASA demonstrated how American ingenuity could overcome nearly any obstacle. In December of 1968, as Frank Borman, Jim Lovell, and I rocketed toward our nearest planetary neighbor, America faced many challenges. It sometimes seemed as if the country was coming apart at the seams. The assassinations of Dr. Martin Luther King, Jr. and Robert Kennedy, the Vietnam War and the protests against our involvement there, and the Cold War divided us against ourselves and against the world. Forces from within and without threatened us. Everywhere, tensions ran high. Still, millions of Americans, and some one billion people worldwide, tuned in on Christmas Eve to watch our crew's live television broadcast from space. One of my assignments was to photograph the lunar surface to facilitate the evaluation of potential landing sites. I brought a 250 mm lens to bring that alien terrain into better view. On our fourth orbit, the spacecraft was oriented in a different direction. A startling image captivated the three of us. Earth, 238,900 miles away, ascended above the barren lunar surface. Compelled by that vision, we scrambled for cameras. I deviated from the rigid NASA flight plan. Every photographic exposure had been determined in advance but I had to capture our view with the long lens on color film. One of those shots became known as "Earthrise." That photograph, shared globally and always in the public domain, has since served to educate and inspire: The Earth we saw rising over the battered grey lunar surface was small and delicate, a magnificent spot of color in the vast blackness of space. Once-distant places appeared inseparably close. Borders that once rendered division vanished. All of humanity appeared joined together on this glorious-but-fragile sphere. Another vision made the hair on the back of my neck stand up. I held my fist at arm's length. That stunning vision disappeared. From one lunar distance our world was easily obscured. At 10 lunar distances Earth would have been but the size of a ladybug. And at 100 — then and now far beyond human reach — Earth would no longer be visible to the naked eye. Here was everything humans had been, everything we were, and everything we might become — and yet our home planet was physically insignificant in space. I thought of my wife and five children on that little planet. The same forces that determined their fates worked on the other three-and-a-half-billion inhabitants. From our tiny capsule, it seemed as if the whole Earth was smaller even than the space the three of us inhabited. Apollo 8 lunar module pilot Bill Anders is seen inside the command module during the historic voyage around the moon in December 1968. From there, the blue-and-white glory of Earth, the only color amidst the blackness of space, became a beacon. Before liftoff I calculated we had a one-in-three chance of returning from a successful mission safely. We did make it home. Hundreds of thousands of people labored together to move us, as astronauts, as Americans, as humans forward. Fifty years later, "Earthrise" — the lingering imprint of our mission — stands sentinel. It still reminds us that distance and borders and division are merely a matter of perspective. We are all linked in a joined human enterprise; we are bound to a planet we all must share. We are all, together, stewards of this fragile treasure. Seen this way, "Earthrise" can continue to serve, for generations to come, and after most details of Apollo are forgotten, as a beacon—not just for the three of us on Apollo 8 — but for all of us together on the good Earth. William "Bill" Anders is a former NASA astronaut and lunar module pilot of Apollo 8, and a Major General (retired) in the U.S. Air Force Reserve. He is long retired from NASA and is currently working on a memoir. Follow us on Twitter @Spacedotcom and on Facebook. Original article on Space.com.